One of East Anglia's most unusual and memorable churches sits just off of the main street of this busy, pleasant seaside resort. Felixstowe today still has its discernable districts, and by the end of the 19th century Old Felixstowe's St Peter and St Paul to the east, Walton St Mary to the north and Felixstowe West End's St John the Baptist were all substantial parish churches at the focus of their communities. The area in between rapidly developed as Felixstowe town centre, and soon enough merited an Anglican parish church of its own. The first St Andrew was little more than a hut, on the present location of the church in St Andrew's Road, but the enthusiasm of arch-evangelical vicar of the 1920s, Henry Greene, could not be satisfied with this. Half a mile away, on the other side of Hamilton Square, stood the mighty St John the Baptist, one of the most unequivocal statements of large scale High Church Anglicanism in the county. A stone's throw from St Andrew itself stood the substantial Catholic church of St Felix. Greene engaged Hilda Mason to produce the design for a church that would be a similarly grand statement of Protestant triumphalism. 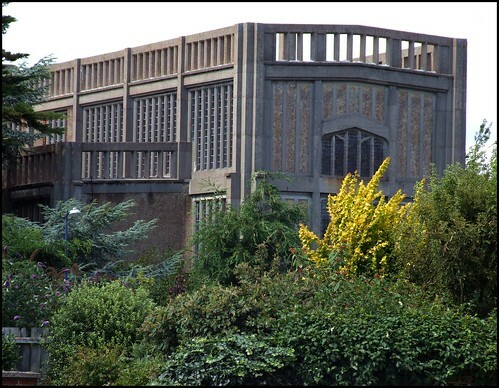 The result was England's first reinforced concrete church. But her design foundered on its use of contemporary stained glass design - Green said it made the church look like an Italian ice cream parlour. The task of completing St Andrew fell to the then little-known Raymond Erith. It is as striking and startling a building today as then - perhaps more so. It is most often seen first from Hamilton Road, where it rises above domesticated trees and mock-Tudor semis. The stark, uncompromising concrete is severe in this gentle suburbia. And yet, it is rather traditional, too; the elevation of nave, aisles and porches is familiar from hundreds of Suffolk churches, since Mason and Erith used the language of late medieval Perpendicular. As you walk towards the church, you can see straight away that a tower was also planned; the stair turrets are in place, and lancet windows show where the fixings would have been. It would have been a grand tower, traditional in character if not in materials, and there is an architectural drawing of it in the church. The Perpendicular style of St Andrew is entirely appropriate. The 15th Century was a time when the dark shadowy clutter was being cleared out of churches, and the new emphasis on preaching was leading to the emphasis on a corporate act of worship over private acts of devotion. In those late medieval days, the Priest came out of the chancel into the pulpit for the first time, and benches were installed so that people might sit and listen to him. Apocryphal wall paintings were whitewashed and replaced with doctrinal symbols, Saints and Biblical scenes, and there was a movement to reassert the orthodoxy of the Catholic Church over local superstitions and abuses. It was, of course, the primacy and orthodoxy of the Reformed Church which Henry Green planned to reassert in the 1920s, but there is no doubt that this was the architecture to serve his purpose. The 1920s was a time when Anglo-catholicism was in the ascendant, and Protestant militantism, in the CofE at least, didn't have a great deal to be cheerful about. One event which dispelled a little gloom was the rejection by Parliament of the revised Book of Common Prayer in 1928. This book would have enshrined in law the High Church practice which the Anglican sacramentalists were enthusiastically introducing, and would have overtaken Cranmer's simple liturgy. Its defeat was seen as a great victory in Evangelical circles. The other people who were relieved were, ironically, extreme Anglo-catholics, who preferred to use the Roman missal. That historic moment became the occasion for the dedication of St Andrew, and a plaque to the west of the porch remembers this. The porch itself is a formalistic exercise in late Perpendicular, and instantly recalls to mind grand Suffolk porches like Boxford and Bildeston. The aisle that it ajoins is, again, a formal exercise, its parapet like a balcony. The north aisle is broadly similar, and this formalism becomes a proto-Modernism, and the terracing effect is familiar from Denys Lasdun's University of East Anglia at Norwich, from 30 years later. Above them, a clerestory rises, a juxtaposition familiar again from hundreds of medieval East Anglian churches. Inside, the concrete lifts the eye uncompromisingly, rising in Perpendicular sheathes and pillars. The painted plaster between the concrete beams gives a curiously half-timbered effect. The woodwork repeats this motif in shafts and panels, lightened here and there by gilt inscriptions like that on the pulpit, lectern and the altar. The inscriptions are clearly not intended to be ambiguous. On the pulpit it says We preach Christ and Him Crucified, and the lectern weighs in with The Sword of the Spirit is the Word of God. The font reinds us of Christ's injunction to Suffer Little Children to Come Unto Me, and the altar enjoins us to This do in remembrance of Me, which the reredos reaffirms with He is not here - He is risen, which may have been intended as a denial of the doctrine of the real presence taught across town at St John the Baptist. The two best 20th century churches in Suffolk are twelve miles and ten years apart. All Hallows, in Ipswich, was built entirely in an Art Deco style, and there is no doubt that its designer, the Anglo-catholic Diocesan Architect H Munro Cautley, was working in reaction to St Andrew's proclaimed protestantism and perceived Modernism. Both churches are superb survivals, beautifully preserved and maintained in almost entirely their original form, and both are essential viewing for anyone interested in the Church of England and its buildings in the last hundred years. The bluish light above and the red carpeting below give St Andrew a sense of cheerfulness, but there is also a sense of gravitas from the rational light which pours in through the enorrmous Perpendicular windows. As I write in 2008, the church is undergoing a refurbishment, which is carefully keeping to the original decor. Henry Green remained as Vicar of Felixstowe until after the Second World War, and is remembered in the panelling of the chancel as A Faithful Protestant and Preacher of the Gospel. He would have been pleased to know that his militancy outlived him, and that this church remained at the extreme end of Anglican protestantism until the end of the century. As elsewhere in the Church of England, there has been a realignment, as the extremes move back towards the centre, but still today this is the evangelical beating heart of its community.